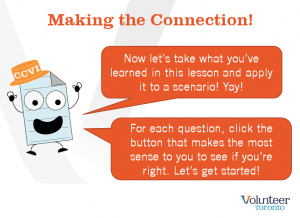 The easiest way to expand your volunteer management skill set and learn something new! 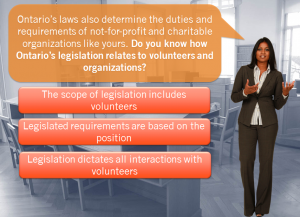 Available on any browser, 24 hours a day, these pre-recorded eLearning modules are a fun and interactive way to learn about a variety of volunteer management topics. 10 Steps of Screening – NEW! In Planning for Volunteer Involvement, you’ll learn how to create an action plan to reach your goals in your volunteer program, how to get staff buy-in for volunteer involvement, how to write policies and procedures for your volunteer program, how to create a volunteer handbook, and how to identify ways that volunteers can contribute to your organization. 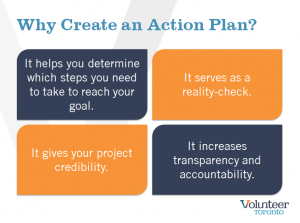 Lesson 1 – How to Create an Action Plan Learn about the benefits of action planning to prepare for your volunteer program. Lesson 2 – Getting Staff Buy-In for Volunteer Involvement Answer the comments and questions about volunteer engagement you might get from staff. 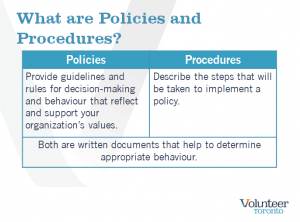 Lesson 3 – Policies & Procedures for Volunteer Involvement What are the basic policies and procedures you need to have in place to engage volunteers? 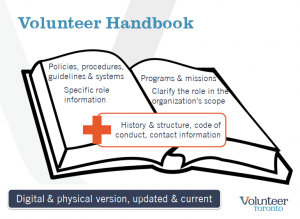 Lesson 4 – How to Create a Volunteer Handbook Ensure your handbook has all the right pieces to give your volunteers the best tools from day one. 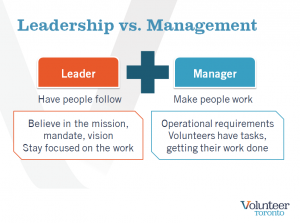 Lesson 5 – How Can Volunteers Contribute to Your Organization Understand the needs of your organization and how volunteering can help improve your program delivery. 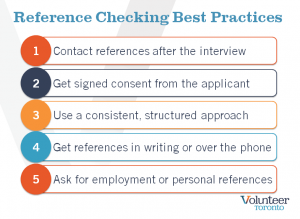 In Recruiting & Selecting Volunteers, you’ll learn how to find the right fit for your volunteer positions by writing effective position descriptions, promoting your volunteer positions, interviewing and assessing volunteer candidates, and recruiting skilled volunteers. The steps and pieces of the most important part of the recruitment process. 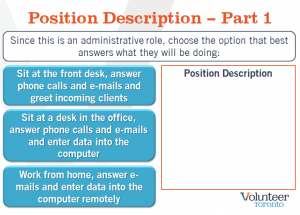 Making sure your position descriptions are seen and applied to. 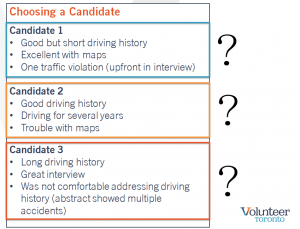 Who’s the right fit for the volunteer role? Here’s what to look for. The interview is an integral part of screening – this lesson has you covered on planning your interview. 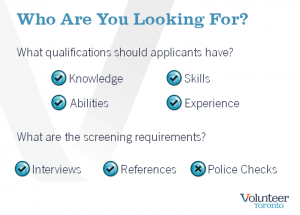 High-skilled volunteers are a growing group – are you ready to recruit them? In Orientation & Training, you’ll learn how to train volunteers from orientation to ongoing role training. You’ll also learn how to train adult learners and how to be an effective and inclusive facilitator. 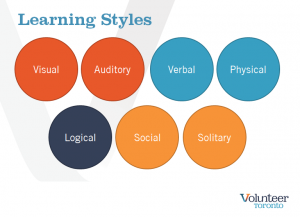 Many volunteers are adults – how is training adults different from youth and children? Lesson 2 – What is Orientation? Learn about the three main structures of a volunteer orientation and the best ways to present information. 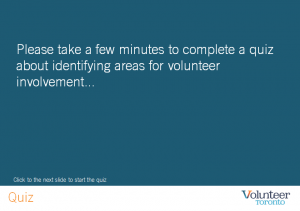 What do you include in your volunteer orientation? How do you cover all the topics? After your initial orientation, what kind of training is necessary to ensure volunteers can be successful in their role? Ensuring your training is inclusive, accessible and effective is important to keeping volunteers learning. In Volunteer Supervision, you’ll how to manage people and tasks effectively, provide meaningful feedback, coordinate off-site volunteers and react when things go wrong. Volunteers are a vital human resource – how do you manage this resource effectively? 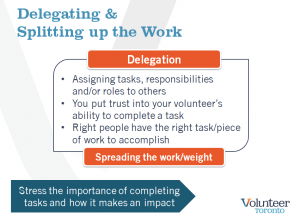 Learn about the importance of delegating tasks and keeping track of volunteer activities. Feedback is a two way street – how do you give good feedback and why is receiving feedback so important? Learn how to manage, coordinate and oversee your off-site volunteers, no matter where they’re working. Sometimes, volunteers break rules or boundaries – how do you react? I dismissal the right answer? 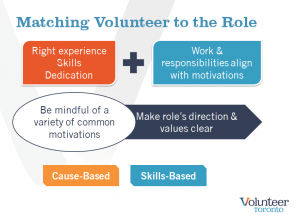 In Volunteer Retention, you’ll learn how to recognize volunteer contributions, how to keep your volunteers motivated, how to avoid volunteer burnout, how to use performance coaching to help volunteers stay productive, and how to provide meaningful and rewarding volunteer opportunities. Learn about the cornerstone of volunteer retention: the value of appreciating your volunteers. 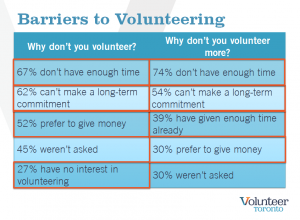 Understanding your volunteer’s motivations can help you learn how to help them stay. 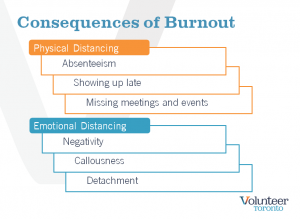 Avoiding burnout can be a challenge – learn about what causes burnout in volunteers. 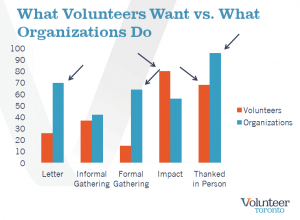 Helping volunteers improve can help their passion for volunteering grow. 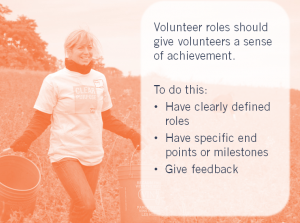 Ensuring the right fit – and that your volunteers are enjoying their work – can help encourage great retention. This course on Accessibility & Volunteer Programs is the newest “Volunteer Management Basics” course – learn about the Accessibility for Ontarians with Disabilities Act (AODA), your organizational responsibilities under the Act and how to prepare your volunteers to work with clients with disabilities. 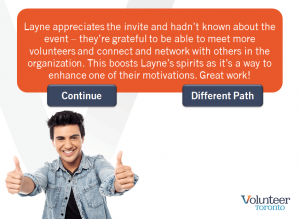 Plus, discover ways to make your volunteer engagement process more accessible and inclusive. Discover the AODA, it’s core principles and how it affects the work you do with volunteers. Learn about the different types of disabilities and how they can manifest, including past & present and visible & invisible disabilities. Covering all aspects of Customer Service Standard training, inform volunteers on how to effectively serve clients with disabilities. Explore your responsibilities – and the possibilities – for accommodating and engaging volunteers with disabilities. 10 Steps of Screening - NEW! 10 Steps of Screening explores the necessity of a well-planned screening process to ensure the selection of great volunteers who can do their role safely and effectively. From risk management to feedback on the screening process and everything in between, the 5 easy-to-use pre-recorded online learning modules will guide you through the steps and make your screening process better than ever. Purchase access now and use the course for one full year! Includes a variety of interactive scenarios and activities and direct links to the Screening Handbook. Course length: Approximately one hour and forty-five minutes. Learn why the 10 Steps of Screening exist and how they can help you create safe & effective programs, while also eliminating barriers and maintaining quality of service. Starting with your risk assessment, create position descriptions that clearly outline the requirements of the role and implement a recruitment plan that takes these risks into account. With application forms and interviews, ask the right questions relevant to the role and collect only the information you need to make an informed decision. References can take many forms, from personal relationships and former managers to police checks to verify the right fit; learn how references factor into your screening process. Screening doesn’t end after you’ve offered the role: see how orientation & training, support & supervision and follow-up & feedback factor into ongoing screening. Volunteer Toronto’s popular course on Police Reference Checks and the Ontario Human Rights Code is now online! Experience all 4 online modules and complete all scenarios, activities and quizzes to receive a Certificate of Completion. 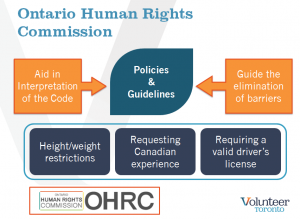 Lesson 1 – What is the Ontario Human Rights Code? 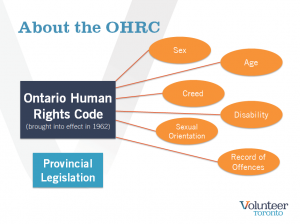 Learn about the history and application of the Ontario Human Rights Code and how it applies to you and your organization. 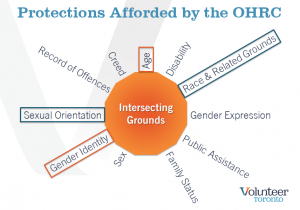 Learn about the 17 protected/prohibited code grounds of the Ontario Human Rights Code. They include race and related grounds, sexual orientation, gender identity, record of offences and more. 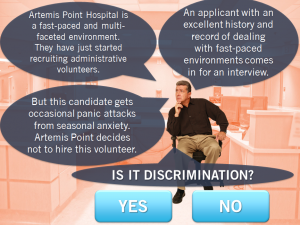 Learn about what discrimination means when engaging volunteers, especially as it relates to police reference checks and bona fide requirements. Also learn about accommodating current and future volunteers. Are you ready to request police reference checks from candidates? 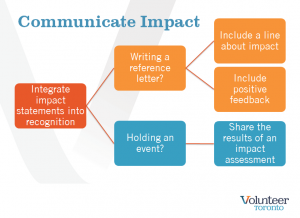 Learn about the strict requirements that need to be in place in order to request PRCs and understand the risks associated with volunteer engagement. Test your knowledge! 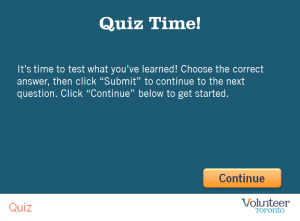 After finishing all 4 lessons, take our quiz to prove you know your stuff. Upon passing the quiz, you’ll receive your Certificate of Completion. 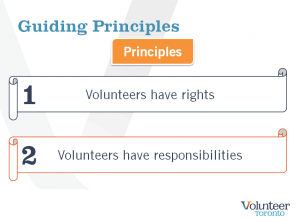 Experience all 16 online lessons which cover each of the Canadian Code for Volunteer Involvement’s values, guiding principles and standards in detail! This online course features the most recent version of the Code (2012) and recent trends in the volunteer management sector. Take the course in any order and complete the lessons most relevant to you! Course length: Approximately 3 hours with all lessons and quizzes combined. What is the Canadian Code for Volunteer Involvement? Where did it come from and when was it written? 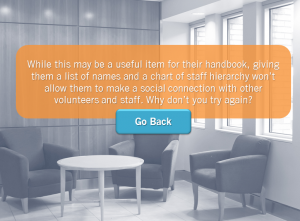 Our guide Paperguy will walk you through the creation and implementation of the Code and help you understand why it’s important to work towards a professional practice in volunteer management. 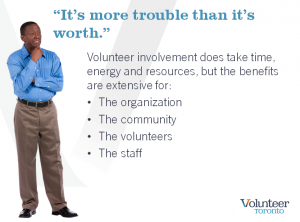 This covers the volunteer program as a whole and your role as a volunteer manager. This section includes information about linking volunteer roles with your mission, understanding and utilizing volunteers as a member of your workforce, establishing, updating and implementing policies & procedures and the necessities of the volunteer administrator role. 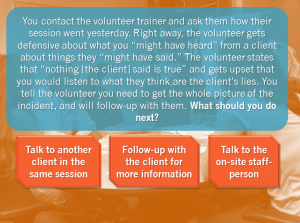 This covers the necessary aspects of planning for volunteers and creating volunteer roles. This section includes information about assessing and analyzing risks of volunteer roles and apply job design theory in the creation of roles. 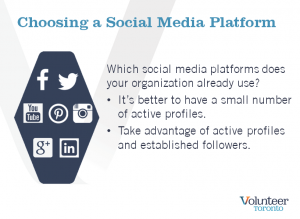 This covers the steps to bringing volunteers into your organization. This section includes information about planning the recruitment campaign, posting roles, screening and interviewing volunteers and providing training & orientation to get volunteers ready to safely and effectively fulfill their roles. 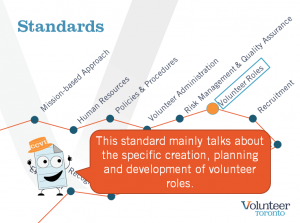 This covers the varying elements of managing volunteers and supporting the volunteer program. This section includes information about providing support to volunteers, supervising roles based on risk, managing and maintaining records, applying technology to the volunteer program, recognizing volunteers in meaningful ways and evaluating your volunteer engagement strategy along with volunteer satisfaction. After learning about all the pieces of the Canadian Code for Volunteer Involvement, Paperguy will guide you through the adoption process and get your organization more volunteer-ready than ever! 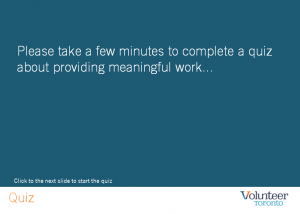 This course on Volunteer Program Evaluation presents the basics and frameworks for creating your own evaluation to answers questions about your volunteer program. As a special bonus, included with access to this course is a review of your program evaluation plan by the Volunteer Toronto team! Complete all the modules and fill out the included program evaluation plan template and we’ll provide feedback on your proposal! Course length: Approximately 1 hour plus time required for completing program evaluation plan template. Lesson 1 – What is Program Evaluation? Learn about program evaluations and how they can help you improve your volunteer program. Answer some questions to get yourself started and learn about the three types of evaluations we’ll talk about in this course. You need data to answer your questions – what types of data are you looking for? How do you collect it? Which method of collection works best? 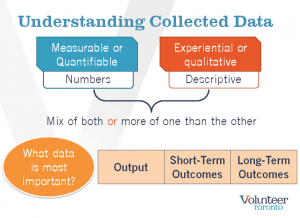 Learn about data in all its forms to help inform your program evaluation process. 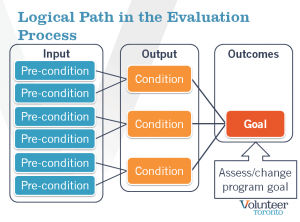 You’ve created your program evaluation question, built a logic model, ensured SMART outcomes and collected data – now what does it all mean? 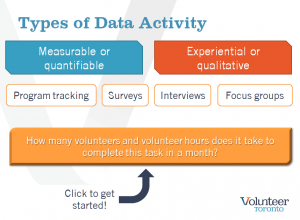 This lesson goes in-depth into deciphering and interpreting the data you’ve collected to find meaningful results and help make lasting change in your volunteer program. What are you waiting for? Get started today! Experience all 7 online lessons with details about privacy legislation, human rights, workplace violence and harassment, accessibility and much more! This online course features the latest changes to the Occupational Health & Safety Act, new definitions throughout Ontario law and upcoming deadlines for the Accessibility for Ontarians with Disabilities Act. Course length: Approximately 1 hour and 45 minutes. Find out more about the legislation covered in this course and understand the distinction between the Employment Standards Act and labour law related to volunteers. Are you keeping your volunteer’s personal information safe? 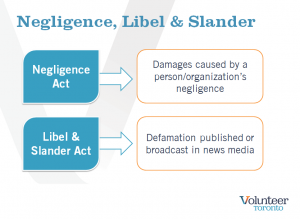 Learn about the laws at play when collecting, storing and destroying personal data. Learn about the Ontario Human Rights Code, the Canadian Human Rights Act and the government Commissions ensuring equality for volunteers. Did you know that the Occupational Health & Safety Act covers everyone in your workplace, including volunteers? Learn how to ensure your workplace is safe and free from violence and harassment for all volunteers, staff and clients. AODA is reshaping Ontario into an accessible province for all by 2025 – is your organization engaging volunteers in an accessible way? Learn about the Act, your reporting requirements and how to ensure compliance. 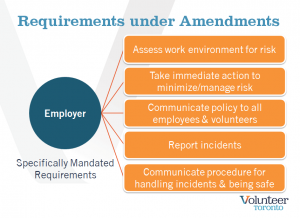 Learn about the other legislation that ensures you are recruiting, engaging and working with volunteers while being fully compliant of the law, including unpaid internships and board members. This course on Improving Recruitment & Retention Strategies explores advanced volunteer management techniques to increase the effectiveness and impact of your volunteer program. 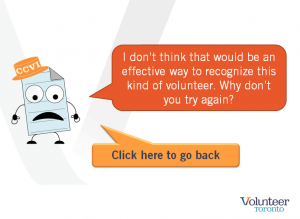 This in-depth online course provides a wealth of knowledge and new thinking on recruiting and retaining volunteers. Course length: Approximately 2 hours and 30 minutes. 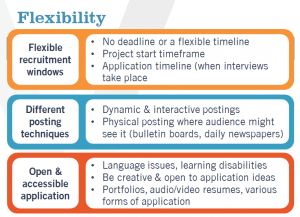 Understand the traditional recruitment methods and learn more about recruiting for specific audiences. Explore the “traditional” recruitment process and see how your recruitment techniques stack up. 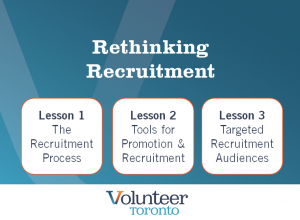 Also learn about ways to rethink and reframe recruitment to better serve your volunteers and community. 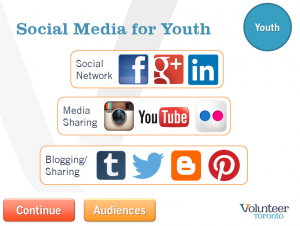 Learn more about a variety of recruitment promotion tools – from social media to grassroots methods – and explore the best ways to recruit for your intended audience. Choose an audience to learn about best practices in recruitment messaging and more, covering: Youth, Seniors & Boomers, Newcomers, High-Skilled Volunteers and Families & Groups. What are you reporting? Explore the relationship between retention and attrition and discover new retention practices. 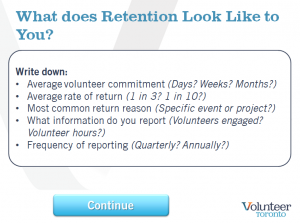 What does retention and attrition mean? And more importantly, what do they mean to you and your organization? Find new ways to understand retention and learn how some reporting doesn’t show the whole picture. 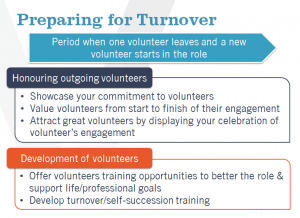 Two great retention alternatives: Succession planning explores the need to prepare for gaps in your volunteer workforce while maintaining relationships can help you build lasting relationships with your volunteer community to minimize attrition. Two more retention alternatives: Learn about connecting with high-skilled volunteers for high-impact, time-limited projects and discover ways to guide volunteer transitions from occasional to short-term to long-term, meaningful roles. This course on Supporting Volunteers explores volunteer motivations, creating mentorship programs for your volunteers, establishing and maintaining volunteer boundaries and managing poor performance, including dismissing volunteers. This in-depth course provides a wealth of knowledge, promising practices and techniques for enhancing motivations and managing volunteer performance. Course length: Approximately two hours. Understand what brings volunteers to your organization, what keeps them engaged and how mentorship can help. 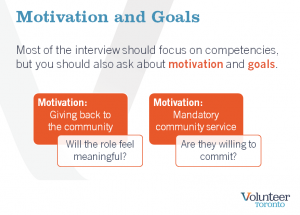 Explore the various motivations that bring volunteers to your organization, how they can change over time and how you can ensure their motivations are being met. 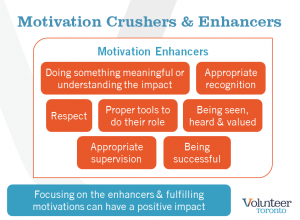 Learn more about motivation enhancers to improve volunteer performance – and the motivation crushers to avoid. 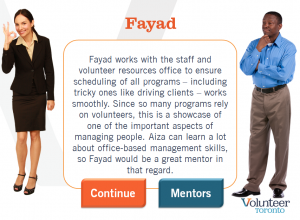 Create a volunteer mentorship program to increase impact, improve motivations and grow your volunteer program. Create great boundaries, understand why they might be broken and follow the steps to improve volunteer performance. What kinds of boundaries exist? Who do they affect? 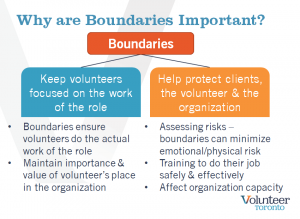 Create meaningful boundaries for volunteers based on risk assessments and more. Explore the various reasons why volunteers might break boundaries – and how to prevent violations in the future. 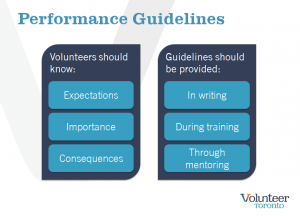 Learn how to coach volunteers to better performance, explore alternatives to dismissing volunteers and understand the right steps for firing volunteers. Fill out the form below to place your Online Learning Course(s) order. Upon receipt of the signed EULA and proof of payment to the licensed Volunteer Centre, Volunteer Toronto will send user access information directly to the user. They will be able to access the Online Learning Centre with this login information, the course they have purchased, and all basics courses. Any member of the purchasing organization can access the course(s) using the same account for the duration of 1 year from the first day of accessing the purchased course. This agreement must be signed prior to accessing the Online Learning Course(s).